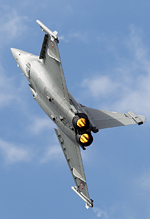 2012 was always going to be a watershed year for the Royal International Air Tattoo. Could the organisers of the world's largest military airshow recapture the Spirit (ahem) that had once made the 40 year-old event so great? Would the British weather ruin everything? 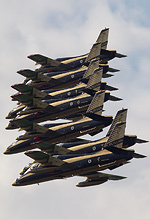 And with the sideshow attractions and X-Factor singers notable by their absence this year, would aeroplanes alone be enough to entice the public and get RIAT back on track? Russell Collins reports from a muddy RAF Fairford. Photography from the UKAR staff team. After RIAT 2011's universally negative feedback, the show clearly had to change and reinvent itself. The furore over Alexandra Burke's costly appearance at last year's show did little to help, as did the booking of many other expensive non-aviation show ground attractions, as the event drifted further and further away from being an airshow in the purest sense. Perhaps most pleasingly from the aftermath of 2011 was that those at Douglas Bader House were prepared to take on board some of the criticisms levelled at them and make positive changes for the future. Certainly, feedback provided by UKAR and it's members seemed to be listened to, and incorporated. 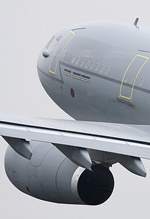 2012 was all about RIAT re-focusing on it's core product - military aviation. From very early in the year, changes were already being implemented with regards to how participants were announced on the Air Tattoo's website. The FRIAT advance participation list was rightly ditched, with additional information about certain negotiations with air arms and the status of those who had responded to their invites. This policy of glasnost from behind the "Iron Curtain" at Douglas Bader House was massively appreciated and should be loudly applauded. 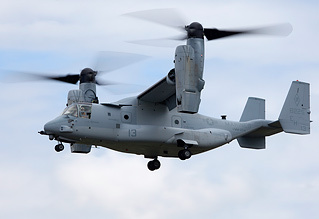 Furthermore, it was not long before some real highlights started confirming on the participation list, such as the USMC MV-22B Osprey and the Republic of Korea Air Force Black Eagles display team, the latter becoming the 52nd nation to attend the Air Tattoo, on a tour marking their European début. There were no less than three new nations present at the show, taking the number to an impressive 54 in the history of the show. 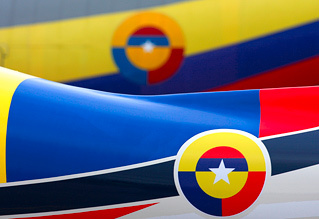 The Koreans were joined by Colombia, whose Air Force sent a C-130 and T-90 Calima for static display. The 54th and last "new" nation was truly historic and one of the final participants confirmed - Japan. The JASDF sent a KC-767J to the show. This was the first time a Japanese military aircraft had ever visited a British airshow - and just the second JASDF appearance in history at an overseas display (the Blue Impulse visited Nellis in 1997, for the record). Although not a début nation, Italy's Aeronautica Militare did send a new type - the KC-767A Tanker Transport - to sit alongside its Japanese counterpart. A late "suprise" confirmation was none other than a USAF Northrop Grumman B-2 (or should that be B-2A?) Spirit for static display - the first time a B-2 has been seen on static display in Europe since RAF Mildenhall's Air Fete in 2000. It's been a long 12 year wait to see the B-2 up close again at a UK show and it certainly hasn't lost any magic or mystique, the type proving to be a must-see static attraction at the show. 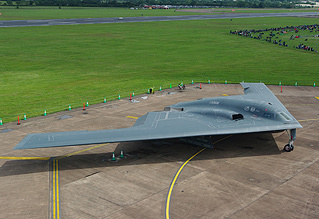 Rumours flew among the enthusiasts that RIAT were not permitted by the USAF to publish the B-2's arrival time, although rumblings of "Friday evening" gathered pace as arrivals week continued. The hearsay was spot on too, as with the appropriate call sign "DEATH11" the "Spirit of New York" arrived at 19:00. Upon arrival, the aircraft headed into one of the hangars on the northside of the airfield. The Spirit was hangared every evening and towed across to its static spot on the western end of the airfield early on the show days. Perhaps surprisingly was how close the public were allowed to get to the Spirit, with the crew very friendly and more than happy to answer questions. It wasn't just the B-2 crew who were friendly either; most of the USAF crews were allowing the public to get up close to their respective mounts, with special mentions to the C-5B, C-17, KC-10, MV-22B and MC-130 crews, who opened up their aircraft to the public. The layout of the static park was to be applauded, with line-ups of Hercules', F-16s and rotary types harking back to the much missed rows of aircraft at Air Tattoos of old. It was a colourful affair too, featuring numerous special liveries and markings including two German Tornados amongst a number of Tiger-liveried jets from other European air arms. Anniversary schemes for the RAF's 3 and 101 Squadrons adorned their Typhoon and VC-10 respectively, but it was the Polish Navy who were awarded the prize for the best specially-painted aircraft at the airshow for the striking Killer Whale artwork that stretched along the fuselage of another UK airshow newcomer, a Mil Mi-14 'Haze' helicopter - the navalised Anti-Submarine Warfare version of the familiar Mi-8 'Hip'. During arrivals week, an old RIAT nemesis reared its ugly head again - the Great British summer, with lots of rain falling in the days preceeding the show. Conditions had made the showground sodden, and some of the offbase carparks bore a striking resemblance to the stereotypical image of Glastonbury! Indeed, at some stages it had looked as if it might be touch-and-go as to whether show would (or even could!) go ahead, bringing back memories of the cancelled 2008 event. Thankfully, RIAT proved well-prepared this time around and despite very wet and boggy conditions underfoot, the show did indeed go ahead. For the most part, the weekend weather was kind for the two show days, Sunday offering the best of the conditions with long periods of sunshine on a warm and dry day. Arrival of the week went, perhaps surprisingly, to the NATO E-3A Sentry, making its entrance at Fairford with a high speed pass down the runway before breaking to what looked like a 90 degree bank, then finally breaking into the right hand circuit for a tight approach. A few jaws had to be picked up after the E-3 touched down. "Get him in the flying display" was overheard in the Eastern Park and View Enclosure. So onto the flying display, as you'd expect at RIAT it was varied and packed with quality. 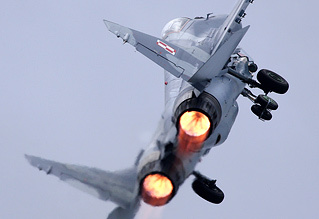 For the fast jet enthusiasts, the Polish MiG-29 put on a superb performance, albeit without a cobra or tailslide, but how we've missed those smoky Klimov's tearing up the sky above Fairford. Other highlights included the ever impressive F/A-18F Super Hornet being put through its paces by Boeing test pilots Ricardo Traven and Steven "Bull" Schmidt over the weekend, the "regulars" of the Belgian and Dutch F-16 displays and of course the popular Armée de l'Air Dassault Rafale C. The rapidly-improving RAF Typhoon display and Tornado GR4 role demo kept the British end up. It was an incredibly difficult week for the Tornado crews after the tragic loss of two GR4s from XV (R) Squadron in the lead up to the show, with Squadron Leader Samuel Edward Bailey, Flight Lieutenant Hywel Tomos Poole and Flight Lieutenant Adam Sanders all losing their lives in the accident. Indeed it was commendable the role demo team even fulfilled their RIAT appointment. Poignantly, the pair of jets performed a missing man flypast to honour their fallen comrades at the end of their display on the Sunday. It was greeted with silence - and then spontaneous applause from some sections of the crowd. 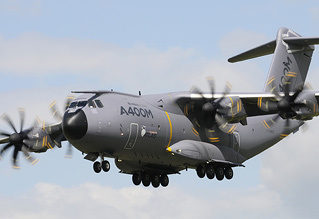 In support of the Skylift theme, the RAF provided a unique flypast from nearby Brize Norton with a VC-10, Tristar, C-130, C-17, Voyager and, thanks to Airbus Military, the newly-named A400M Atlas to complete the sequence. 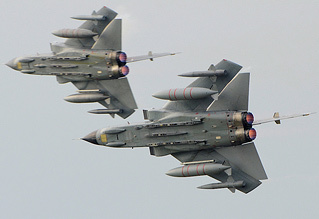 A show of the RAF's capability, both current and in the future. It was tinged with sadness though, as this will almost certainly be the final chance to see the venerable old "Vicky Ten" at RIAT, with the type slated for retirement in March 2013. Wednesday's arrivals was another reminder of this sad fact, with VC-10 C1K XV104 passing overhead on it's last ever flight, to Bruntingthorpe, where it will be stripped for spares and ultimately scrapped. 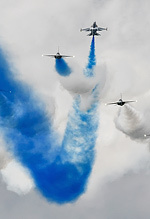 Another coup was the appearance of the "EIIR" formation of 27 RAF Hawks to celebrate the Queen's Diamond Jubilee. Indeed, this had only previously been seen once before, in honour of Her Majesty, at the Diamond Jubilee Celebrations over Windsor Castle in May. Other notable highlights included displays from a DHL Boeing 757 (Saturday) and Boeing 767 (Sunday), the smart but brief MV-22B Osprey display, a "bombed up" Yak-130 "Mitten" and a wonderfully aggressive RAF Chinook display. Avro Vulcan XH558 made it's first display of the season at the show after needing a double engine change. Phil O'Dell, a man qualified on countless aircraft, performed his first full Vulcan display on the Saturday putting the aircraft through a tight and noisy routine, only to be upstaged by "Mr Wingover" Kev Rumens on the Sunday, who once again pushed the aircraft a few more degrees beyond 90 in a display hailed by many as the best they'd seen from XH558 post-restoration. Tremendous to see and not a bag of silica gel in sight! The only negatives on our forums seem to surround Sean Maffett's increasingly twee and cringeworthy commentary. 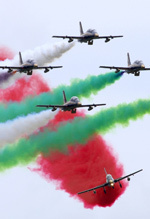 Fans of display teams were spoilt rotten at the show, with the début of the UAE's Al Fursan flying seven MB339's. While they are a new team, they have had assistance from the flamboyant Frecce Tricolori and it shows, with Al Fursan copying (albeit without the well-honed panache, as yet) some of the Italian team's signature manoeuvres. The Patrouille Suisse, Breitling Jet Team, the seven-ship Red Arrows and Royal Jordanian Falcons also displayed. But the one display team everyone was talking about was the Republic of Korea Air Force's Black Eagles, flying eight T-50B Golden Eagles. 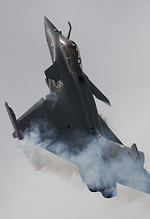 After making their European début, and carrying off an award on the previous weekend at RAF Waddington, the team once again put on an outstanding show. I genuinely thought the novelty would have worn off, but it really hadn't. 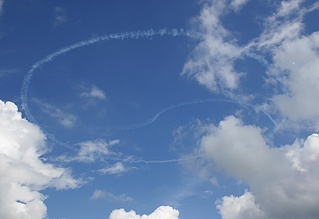 The drawing of the South Korean "Taeguk" symbol using the smoke system of two of the T-50B's is a simply brilliant and unique airshow moment, right up there with Chile's Los Halcones drawing their national star. The T-50B's ability to make quite a racket certainly adds to an already brilliant routine. It wasn't just in the air that the team won plaudits. On the ground they were regularly seen chatting to the public and giving out free posters and stickers. Commentator Dan O'Hagan called them "the airshow scene's best kept secret" and it's easy to see why. They also won an impressive two trophies at the show - including the As The Crow Flies prize, voted for by the 1,400 members of FRIAT. Hopefully, despite the incredible logistics it took to bring them to these shores, they will return to the UK in the not too distant future, as they have certainly left a genuine impression. We'll lay ourselves open to accusations of bias, but the RIAT commentary team of UKAR's aforementioned DanO, Classic Aircraft magazine editor Ben Dunnell and former Officer Commanding 99 Squadron "Spiv" Gair, seem right at home at the show, and sounded this year to be especially settled and comfortable in their roles. The team managed to hit the right tone and depth in terms of information, without over-complicating it for Joe Public. If there is a better airshow commentary team in the business, I'm yet to hear them. A pleasing 130,000 visitors attended the airshow over the weekend. Additionally 39 air arms, from 25 nations were present. Between them 268 aircraft attended. Two of those aircraft bade their farewells to RIAT, namely the RAF VC10 and Luftwaffe F-4F Phantom. They'll be much missed. There has always been talk on our forums that Farnborough years mean the corresponding RIAT will automatically be a stronger show than might otherwise be the case. 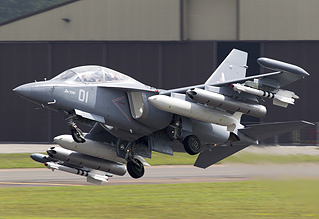 While the last few years saw both shows extensively supporting each other, this year the only real Farnborough items that attended RIAT were the MV-22B's, F/A-18F and Yak-130. This might show that RIAT now is less dependent on Farnborough; whether that's because RIAT has rebuilt it's stature, or that Farnborough is now a shadow of it's former self is up for debate. Perhaps the real reason was the behind-the-scenes changes at DBH. Deputy Director of Air Ops Rob Windsor left the team before Christmas, to be replaced by Tom Gibbons, with Caroline Driver and Geoff Brindle working tirelessly in the interim. The new team has certainly set high standards for 2013! Because we attend shows as paying punters like the rest of you, on UKAR we always try to critique airshows for everyone's benefit, but I am genuinely struggling to find any real negatives about RIAT 2012. 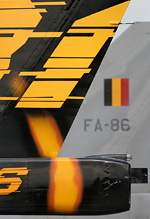 Perhaps the show lacked a major star in the flying display, such as an F-22, B-2 or Su-27. Nothing flying from the USAF was disappointing, although unavoidable given the mass reductions in USAF Demo Teams. Nobody could suggest the USAF didn't support the show looking at the static line up. Certainly there are many challenges ahead for the show, but we have every faith that the new people at the helm can rise to them. RIAT 2012 was a perfect example to all airshow organisers. 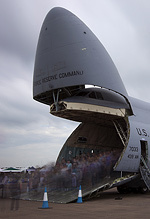 Secure exciting and rare aircraft and the crowds will flock in their thousands to your airshow, without the need for circus-freak side shows and washed-up pop stars. The demons of 2011 have been thoroughly exorcised. The king is back - the organisers should be proud.